Superman may be the most iconic creation of American popular media. Everybody knows the guy, and knows what he's all about. That might be why he seems to be at the center of so many Elseworlds stories - Superman is still Superman, even when he's taken from his usual settings and put into strange times and places. But still, what if his never-ending battle for truth, justice and the American way was replaced by Stalin, socialism, and the international expansion of the Warsaw Pact? That's the world looked at in Superman: Red Son. The idea came from an old imaginary story that saw baby Superman's rocket landing in neutral waters between Russia and the U.S., with both sides racing to claim it. That story stuck with a young lad named Mark Millar, who would use the question it raised - what if the Russians had gotten Superman - and spin it out, decades later, into a full three-part story. The character is still relatively the same: he's still a farmboy who believes firmly in the ideals of his country, it's just that he's now from the Ukraine instead of Kansas, and he heads to Moscow instead of Metropolis. Red Son is epic in scale, following Superman from birth to death (and beyond) in just about 150 pages. This is, in all truth, a completely run-of-the-mill Superman figure. The sculpt is fine, but nothing remarkably better than any Superman DCD has given us before. Superman looks strong, but not ridiculously over-muscled, and he's got the big square jaw. His hairline seems bit further back than we might expect, but that spitcurl is unmistakable. His neck is sculped with a permanent twist, so if you want him to line up properly, he'll always be looking off toward the horizion - appropriately enough for a Socialist, to his left. Though the shield on his chest is not a sculpted element (a very strange choice), the upper edge of his suit is a small ridge, the cuffs on his sleves are raised, his belt buckle really stands out and even the edges of his trunks and boots are sculpted. Again, it's nice, but not spectacular. Same with the articulation, which is completely on par with most DC Direct toys, though Red Son Superman does get bonus wrists. Still, the best Superman DC Direct has ever made is still the first one, with the ankles and the balljointed neck. Where this Superman does stand out is his paint job - rather than the primary-colored circus suit of the Superman we know and love, the supersuit is a few different shades of gray. A very sensible color that showed his solidarity with the workers, rather than setting him above them. Still, he's got splashes of red: his belt buckle, chest symbol and the cape on his shoulders. The paint is all nicely crisp where the pink of his skin meets the black of his hair, but it gets a bit messy around the belt. 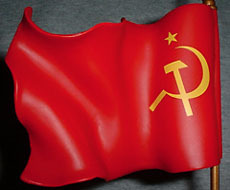 In addition to the Elseworlds base shared by all the figures in this series, Red Son Superman has one real accessory: a 3" communist flag on a 10" pole. It's a nice piece, and suits the character well - if you got the JLA Superman with the American flag, they'll make quite a pair standing next to each other. Red Son Superman was made nicely, but he really doesn't have much to recommend him over any other Superman - if you're a fan of the man from Krypton, this piece might add an unexpected bit of variety to your collection. 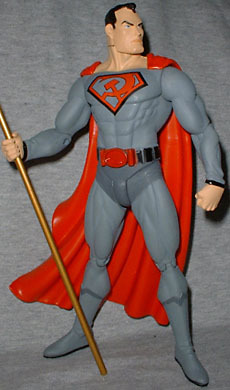 However, if you're just after one unique figure to represent this particular Elseworlds story, then wait for the Series 2 Red Son Superman, which shows an unhappier and less naive Kal-L in his later years. What's your favorite Elseworlds take on Superman? Tell us on our message board, The Loafing Lounge.